Various kinds of small form-factor PCs are on a roll these days. Mini-ITX systems have been offering performance of full-size desktops for several years now and even smaller systems are catching up in terms of performance. ZOTAC this week said that it had developed an SFF PC with NVIDIA’s mobile GeForce GTX 980 inside. The new system will be showcased at CeBIT and GDC trade-shows this month and will be available later in 2016. The ZOTAC ZBOX MAGNUS EN980 is based on an unnamed Intel Core i-series processor based on the Skylake micro-architecture as well as NVIDIA’s mobile GeForce GTX 980 graphics adapter. The card boasts with a fully-fledged GM204 GPU with 2048 stream processors, 128 texture units, 64 raster operations pipelines as well as a 256-bit memory interface. Performance of the mobile GeForce GTX 980 (which is not a card, but an MXM module) is similar to that of a desktop graphics board with the same brand name. It is unknown whether the version of the mobile GTX 980 is equipped with 4 GB or 8 GB of GDDR5 memory. The TDP of the mobile GeForce GTX 980 is 145 W, which is lower compared to a desktop GeForce GTX 980 (which dissipates up to 165 W), but is still very high. In a bid to cool-down the system with a 145 W GPU inside, ZOTAC had to invent a new liquid-cooling solution with multiple liquid channels and heat pipes. The company does not say a lot about its cooler right now and also does not show the final design of the PC. 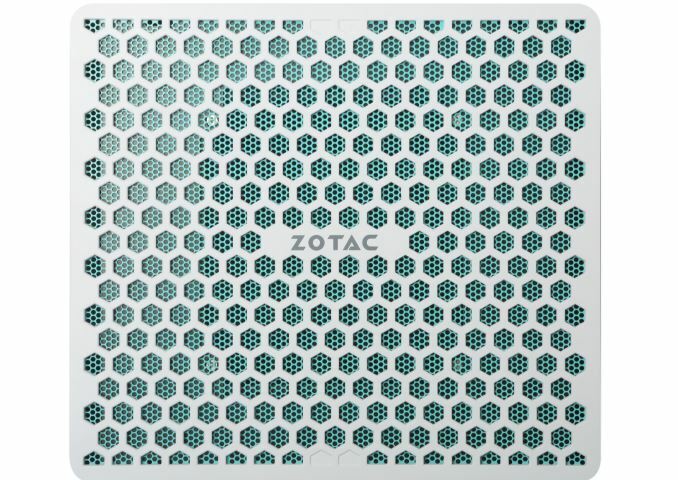 The only thing that ZOTAC officially demonstrated so far is the picture of the top cover of the system. Based on design pattern (which looks like comb, a pattern that is known to be efficient in dissipation of heat), it seems that heat dissipation was among ZOTAC’s primary concerns about this system. Another thing to worry about was acoustics: it is not easy to cool-down an SFF PC that dissipates over 160 W of power (even in case ZOTAC sticks to an ULV CPU, it will still have TDP of at least 15 W) without using high-speed/high-pressure fans. According to the company, it has managed to solve the problem thanks to its liquid cooling system and the PC is “whisper quiet”. The upcoming ZBOX MAGNUS EN980 packs a lot of processing horsepower and uses sophisticated cooling, but not at the cost of elegant appearance. 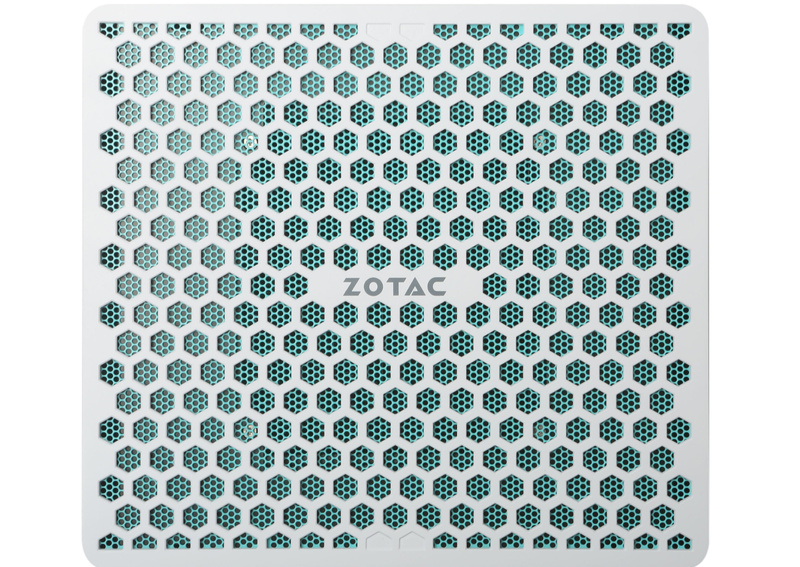 The overall design of the ZBOX MAGNUS EN980 should look rather stylish thanks to grey metal with aquamarine inlays. ZOTAC yet has to announce all the details about its ZBOX MAGNUS EN980. At present, the company only says that apart from an Intel Skylake CPU and the GeForce GTX 980 GPU, the system features two Gigabit Ethernet controllers, one IEEE 802.11ac Wi-Fi and Bluetooth wireless module, a USB 3.1 controller with at least one type-C connector and so on. Keeping in mind rather advanced expansion capabilities of the ZBOX MAGNUS EN970, expect the new system to feature an M.2 SSD, one or two 2.5” HDD, multiple HDMI 2.0 outputs, an SD card reader and so on. ZOTAC positions its new ZBOX MAGNUS as a small form-factor PC for VR gaming. The minimum graphics cards recommended for virtual reality by Oculus VR is AMD Radeon R9 290 or NVIDIA GeForce GTX 970. The MAGNUS EN980 can beat both of those graphics cards, so, there will be even a slight performance headroom in terms of graphics processing horsepower. What remains to be seen is which processor ZOTAC plans to use for its premium SFF desktop. Oculus VR recommends quad-core Intel Core i5-4590 (3.30 – 3.70 GHz, 6 MB cache) microprocessor (or equivalent) for VR Ready systems. Therefore, if ZOTAC wants to meet the guidelines, it will have to install a rather powerful quad-core CPU into its MAGNUS EN980. The ZOTAC ZBOX MAGNUS EN980 will be demonstrated at CeBIT and GDC trade-shows in the coming weeks. The manufacturer does not reveal anything about the price at the moment, but given extensive usage of high-end mobile components, do not expect the desktop to be affordable. That's exactly what I said. And I went further with the TDP because a normal desktop card in a less restrictive environment has a better chance to sustain full load for long periods of time. You can't have a really small AND silent system that's able to cool even a 145W card plus CPU, RAM, chipset, SSD, etc. - they're all crammed in the same box. So something's gotta give. It's a balancing act.